A study published in February concluded that babies who are still breastfeeding beyond 1 year of age need a Vitamin D Supplement to reduce the risk of Vitamin D deficiency. In 2008 the American Academy of Pediatrics recommended 400 IU of Vitamin D daily for infants, children and adolescents. This specifically increased the recommended dosage for infants from the 2003 recommendation of 200 IU Vitamin D (CDC summary). Concerned about the “breastmilk is lacking” message this gives moms, other researchers have looked more closely at where Vitamin D comes from and how we have gotten to the point that artificial supplements are needed at all. Vitamin D is created with exposure to sunlight. Less time spent outside and concern about skin cancer may reduce the amount of Vitamin D we make. Add this to the challenges darker skinned people and those living in far north or south latitudes have always had, and you end up with Vitamin D deficiencies not only in children (rickets being one consequence) but in adults as well. This is what led to adding Vitamin D to the cow’s milk we all grew up on. Newborns get the majority of their Vitamin D from stores laid down during pregnancy. If a mother is low in Vitamin D herself, her newborn will start out with insufficient stores. For all the reasons mentioned above, many moms are going into pregnancy deficient in Vitamin D. Vitamin D supplements given during pregnancy are an important first step in ensuring babies start out with a good supply of Vitamin D.
Breastmilk does have Vitamin D in it, but is not as much as the artificially inflated levels in formula and the milk we buy at the grocery store. That doesn’t mean breastmilk is deficient. Breastmilk was never meant to be the sole source of Vitamin D for a child. Nevertheless, researchers have found that Vitamin D supplementation for mom is as effective in increasing a baby’s Vitamin D levels as is directly supplementing the baby (Hollis, Hollis, Ala-Houlala). So why not just give the baby a Vitamin D supplement? Vitamin D-only supplements may not be widely available. Multi-vitamin infant supplements are available, but include other vitamins breastfed babies clearly do not need. Vitamin drops may also include preservatives or other additives. An exclusively breastmilk fed baby is protected from foreign substances during those first few months when babies’ guts are most immature and vulnerable. The extra time to mature reduces the possibility that baby will have an intolerance or allergy when new things are introduced. 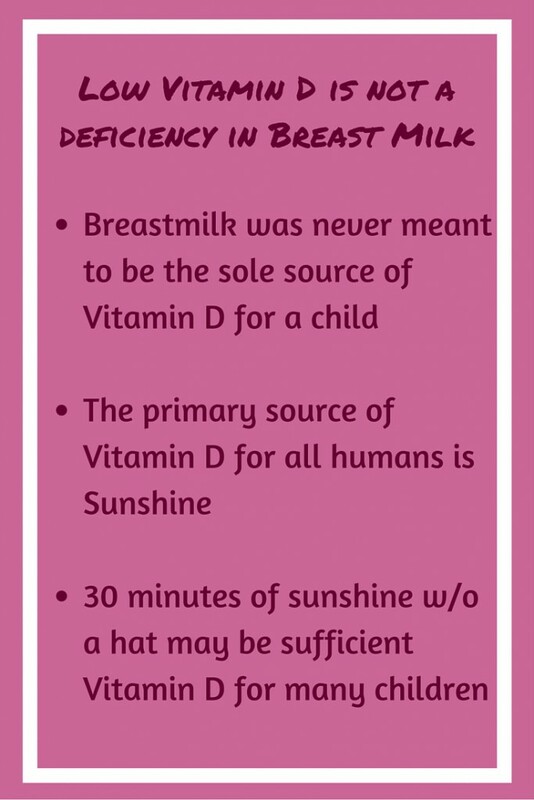 Low Vitamin D is not a deficiency in breastmilk; it is a deficiency in sun exposure. Given the concern about developing skin cancer, why talk about sun exposure at all? In most instances, the amount of sun exposure necessary to create adequate stores of Vitamin D in a baby or child is much less than we might expect. One study concluded 30 minutes a week without a hat was sufficient.There is no one right answer for every mom. 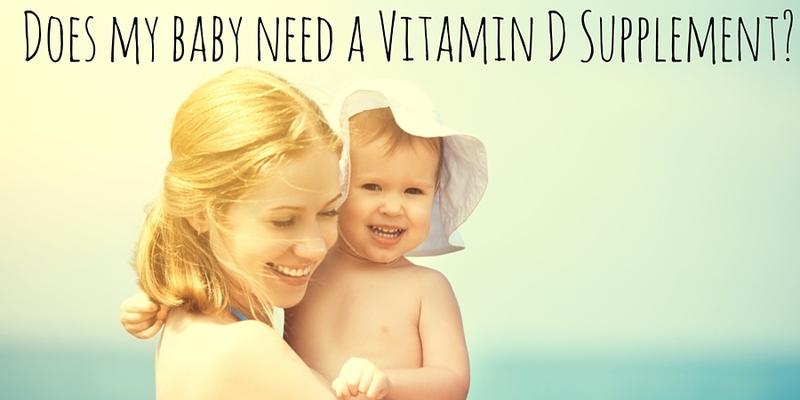 Sun exposure, maternal supplementation, infant supplementation…all of these will protect from Vitamin D deficiency. Just don’t blame your breastmilk. Can hospitals help your breastfeeding plan?